Here you will find information on traveling to and from Campeche. The wedding venue is at a beautiful hacienda in the small town of Uayamón which is some 20 minutes outside Campeche. Most wedding guests will be staying in the town of Campeche, and there will be shuttle buses organized to get guests to and from the various events. Passport holders from the USA, Canada, UK, EU, Australia and most other nationalities DO NOT require a visa to travel to Mexico. You can check the list of countries requiring a visa here. There are two main points of entry into Mexico: Mexico City (MEX) and Cancún (CUN) airports. Short flights of approximately 1h 40m duration connect Mexico City with Campeche (CPE). There are some direct flights from Miami, FL to Mérida, and Campeche is around 2 hours by bus or car from Mérida. There are presently NO direct flights from Cancún to Campeche – if you fly into Cancún you will be routed to fly via Mexico City to Campeche. Kayak – Search for flights on the best aggregation website out there. Flightfox – Let the experts do the work for you! Get multiple travel agents to search and find your desired trip as they compete with each other to find the best and cheapest airfare. If and when you select one of their options the flights get booked and they get a small bounty for their services. We highly recommend Flightfox for people traveling from afar or for those of you with unique travel needs. DECEMBER 9TH UPDATE: AEROMEXICO ARE HAVING A PROMOTION FOR FLIGHTS BETWEEN MEXICO CITY AND CAMPECHE OVER THE WEDDING WEEKEND. RETURN AIRFARES ARE JUST US$125! TAKE ADVANTAGE OF THIS SALE WHILE IT LASTS! Drive: It is possible to drive from Cancún to Campeche via Mérida – total travel distance and time is 480km and around 5 hours. 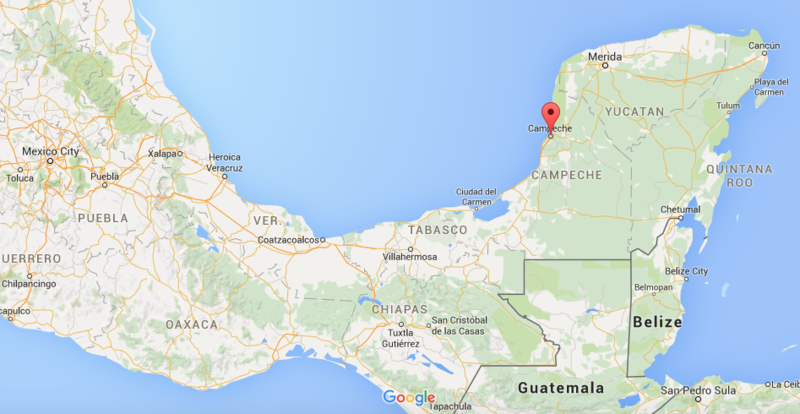 Campeche is around 2 hours from Mérida. Tour: We are planning to organize a private 3 day/2 night tour from Cancún to Campeche the week of the wedding for our families and wedding guests. The plan is to take in the sights and activities along the way and arrive in Campeche on Thursday, March 31st for the start of the wedding weekend festivities. The cost will be less than $300 per person including two nights accommodation in Merida. You can find more information about that option here. Bus: Several bus lines run regular daily services between Cancún and Campeche. The trip duration is around 6-7 hours, including a short break in Mérida. ADO: ADO offers about 8-10 buses per day on the route with both their first class and more deluxe ADO GL buses (headsets for music and movies, 2 restrooms, etc.). Cost is around 600 to 750 pesos one way, depending on the choice of class and whether you buy the ticket in advance or not. Information on other companies and prices will be posted here soon.